Tales from Pollycraft: Pollycraft Challenge the great outdoors... and Little Stars winners. Pollycraft Challenge the great outdoors... and Little Stars winners. I hope you are all well?? 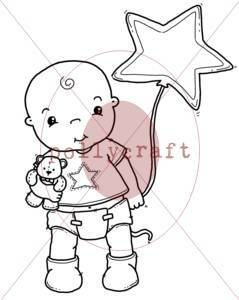 Before I share my card, I'm sure you'd like to know who has won one of the new Little Stars Babies!! She's been coloured with promarkers. we hope you can join in the challenge this week!! Just gorgeous Paula! You make me want to pull out the oldies but I'm still having so much fun with the newbies!! lol. Love how you've made your tree 3d with the punched out leaves and that sentiment is perfect. This is gorgeous!! Just gorgeous. LOVE the flower and leaf detail!! I gotta get my hands on the DCWV stack - LOVE that patterned paper!! Love her! She is one of my all time faves! Lovin' the doodling! What a beautiful card, love the way you have put the flowers on the tree. 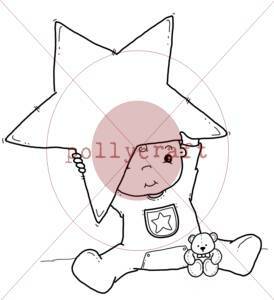 I was so suprised to see I have won a Little Star Baby. Thank you so much, I look forward to playing with it and hopefully will do it justice. Gorgeous card Paula. I love the tree and flowers - they look fabulous. Beautifully colored and that sheer ribbon is perfect. Stunning card Paula! I love the way you have coloured Cherry Kisses and those flowers and leaves are awesome! Such a beautiful card, gorgeous colours and love the leaves/flowers. wow,Paula, it is simply stunning your detail is just Lovely and so fantastic, I love it. I do love your art and creative mind! I'll be watching this blog closely, thank you for giving us so much of your time and mind. You make so wonderful and lovely works! I enjoyed the visit on your site. Many thanks for your beautiful inspirations!! How creative and so beautifully done. Please take a look on my Blogspot.